Are energy drinks bad for you? It depends. With so many products calling themselves “energy drinks” it seems a bit silly to say, “Energy drinks are bad, unhealthy and dangerous.” The truth is many different products (not just energy drinks) have similar faults. Some products are worse than others and there are a few easy tricks for sorting the healthy from the hyped up. GREEN-EYED INSIGHT: As a food biochemist, my main goal is to help consumers everywhere see these products like I do. Let’s use this poor product to demonstrate how painfully easy it is to spot a bad product. Here are 5 tricks that will help you avoid any nonsense functional beverage, be it protein shake, fruit smoothie, energy drink or other. 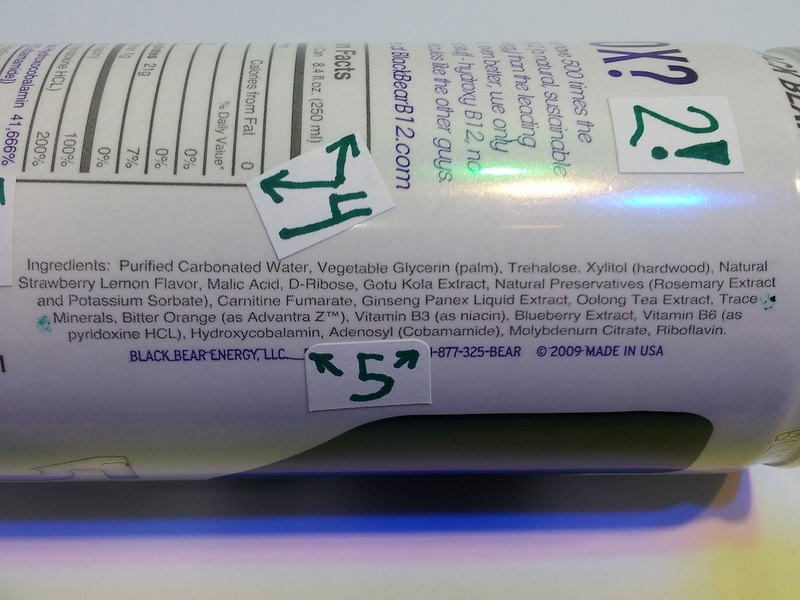 First of all, B12 is a “natural, sustainable source of energy”. Are we mining B12 now? What is that about? It seems like someone used Google AdWords to find keywords associated with “energy” and “sustainable energy” was a top hit. While B12 serves as a hurdle for Veganism, it also serves as ammunition for those who like to tell scary stories about fortified foods. One of the six groups that attaches to the cobalt in B12 is a cyano group. While cyanide is a popular poison amongst 007 villains, the context makes all the difference. There’s cyanide in an apple. Chloride is a toxic gas and sodium chloride is table salt. Despite what you may find on the internet, cyanocobalamin is not deadly. In fact, it’s the most stable form of vitamin B12 and it’s one of the most common forms produced commercially from bacterial fermentation. It makes me laugh when a product tries to win points by comparing itself to “the other guys”. It makes me sad when a product is banking on how few people know the famous quote by the Father of Toxicology, Paracelsus – the dosage makes the difference. TRICK #3: Vitamins are good for you, so more vitamins must be really, REALLY good! This product is named 500X because it has 500 times the amount of B12 as “the leading energy drink”. Well, here’s the problem. According to Energy Fiend’s Top 15 Energy Drink Brands report, Red Bull was number one in sales, with Monster and Rockstar coming in second and third, respectively. Red Bull has 80% of the Daily Value for B12 per serving, but both Monster and Rockstar have 100% per serving (and usually two servings per can). 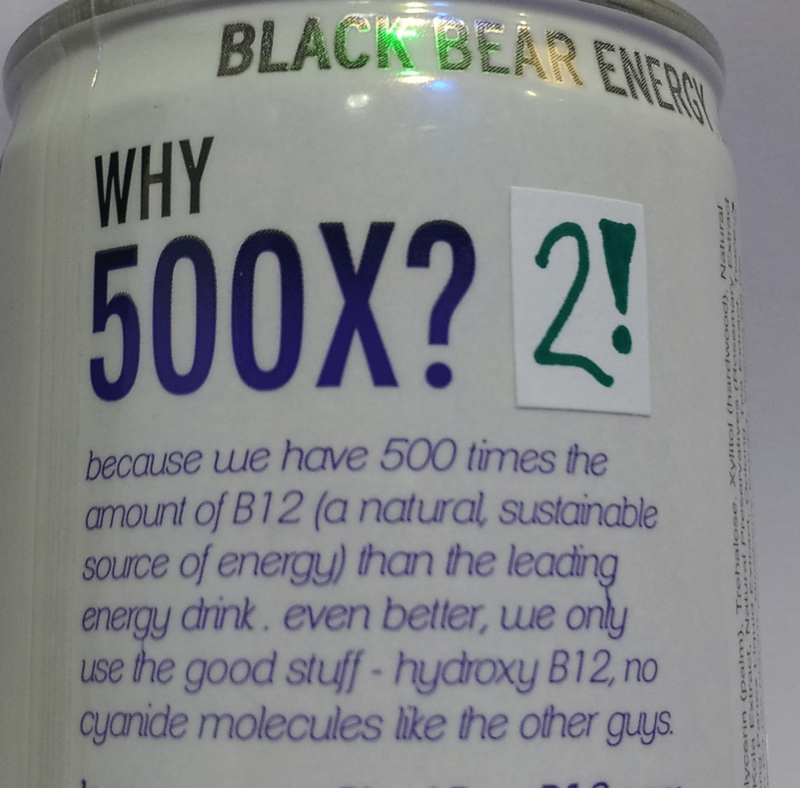 That means this 500X product actually has more than 500 times (41,666 / 80 = 520) the B12 of “the leading energy drink” but only ~200 times (41,666 / 200 = 208) the second and third most popular energy drinks. I guess 500X just sounded cooler. Who doesn’t pick their energy drink by how cool the name sounds? (Hypocrite alert – I pick my wine by how pretty the bottle is…but still) More vitamins doesn’t always mean the product is better for you. 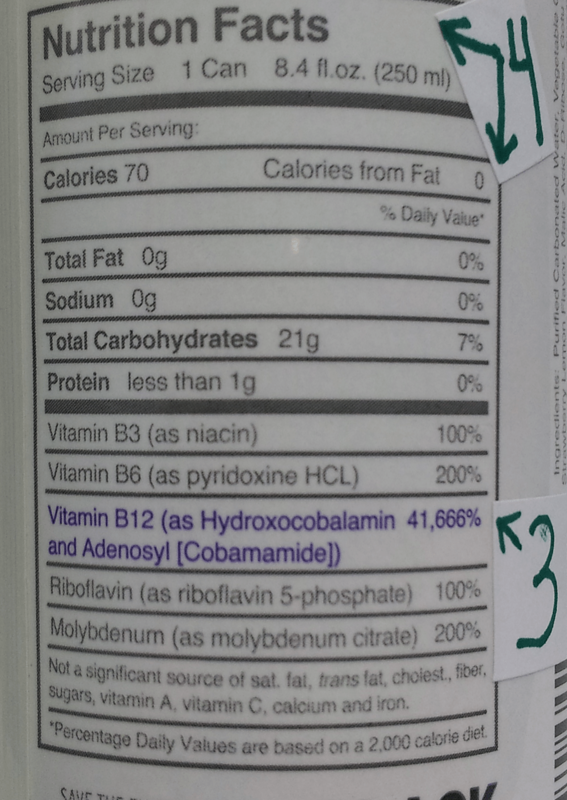 There is no recognized tolerable upper intake level (UL) for B12 but it doesn’t make any sense why anyone would need this large a dose of this vitamin. In Are You a Monster or a Rock Star, you can read how B12 works, what food sources contain it (and why the claim “Vegan” on a B12 supplement is suspicious), what B12 deficiencies look like (and why it might take a few years to even notice you’ve got one), how the elderly have a harder time absorbing natural (NOT fortified) B12, and why JFK and Margaret Thatcher deserved their B12 vitamin injections. TRICK #4: Fiction or Facts Panel? I found it interesting that there is a decent dose of carbohydrates but neither fiber nor sugars are itemized and the teeny-tiny print toward the bottom says “Not a significant source of fiber, sugars…” Okay, so where are those carbohydrates coming from? If you’ve ever had too many grams of fiber or sugar alcohols and had to spend an hour in the bathroom, you’ll understand why it’s good to identify the carbohydrate profile. In this case, we’ll have to wander our eyes over to the Ingredient Line (IL) to find these mystery carbohydrates. Lo and behold, the IL reveals another red flag. It just keeps getting better…. Some people have the mentality, “If you can’t pronounce it, it doesn’t belong in your body.” Counter-argument: how many people can properly pronounce acai or quinoa? Moving on. The Ingredient Line reveals the carbohydrates are most likely Trehalose (see this link for details on what trehalose is/why it’s different and better than sugar). At the end of the third line and the beginning of the fourth line, you’ll notice “Trace Minerals.” There isn’t really a precise definition of “trace minerals”, which are also called “essential microminerals” in some cases. In nutrition, iron, zinc, copper, iodine, selenium, chromium, molybdenum and manganese are considered “trace minerals”. The “trace” term is supposed to indicate the body needs less than 100 milligrams per day. This product contains trace minerals…but what does that mean? All of them? 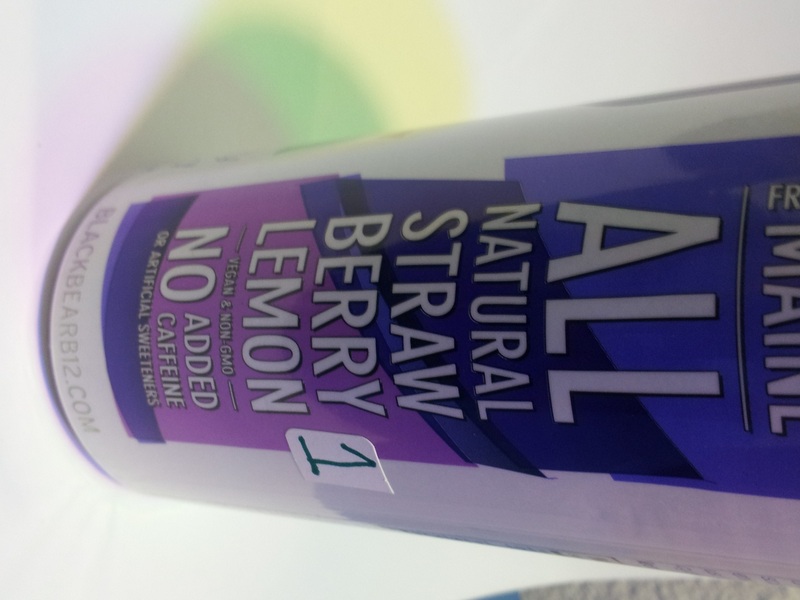 Does this product contain 100 milligrams of each or just a proprietary blend? The trace mineral molybdenum appears as Molybdenum Citrate at the very end of the list so I guess it’s not included with the other “trace minerals” mentioned above. Overall this is just a little suspicious. 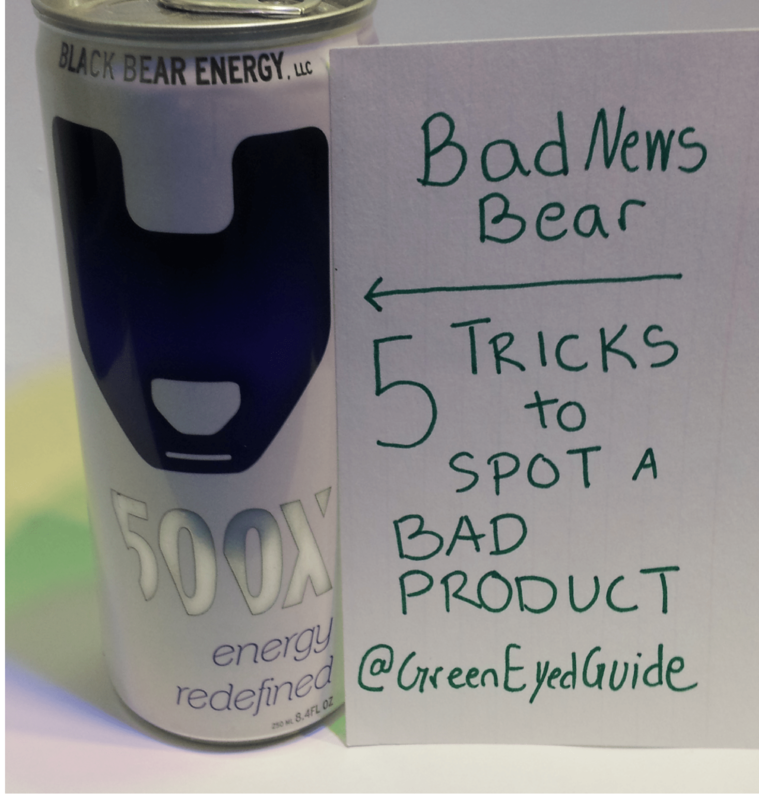 Bottom Line – If you really want to be a savvy shopper and conscientious consumer, use these tricks to compare products and watch out for the suspicious buzz words, ambiguities, inconsistencies and other red flags.